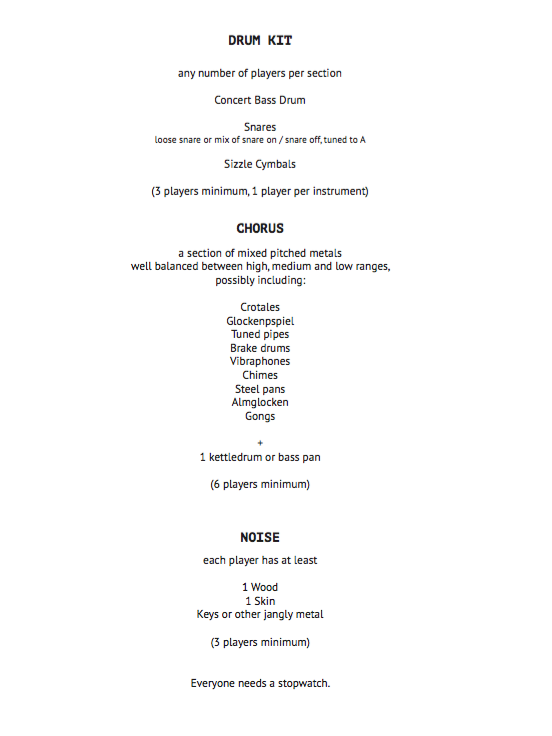 AMEN can be played by a large ensemble of at least twelve players. The instrumentation is partially open, and it is a graphic/stopwatch score (see photos for more information). It is exactly 15 minutes long. AMEN is a slow-motion walk through the Amen Break, a 7 second clip from a funk song from 1969 by The Winstons. It has been called the most influential 7 seconds in music – DJs have used it as the drum break in innumerable tracks, spawning whole genres of dance music where it is an essential element. Now that it is ubiquitous, I hear in it a challenge: am I creative enough to make something new and personal out of this increasingly generic bit of sound? Whether a yes or a no, AMEN is my answer. Most DJs speed it up to a frenzy. I slowed it down. Way down. You hear it at several speeds in this piece; at its slowest, the 7 seconds takes nearly 10 minutes. At this pace, each kick and snare swell and rise like a glacial wave, while the cymbals spread out into a ringing sea. One theory about why this break is so satisfying to hear has to do with the golden ratio. At more or less this magic point in the loop, a syncopation breaks the established groove. Wanting to magnify its essence, I replicated this proportion at every scale of the piece. You'll hear three groups of instruments play the slowed-down break once in each of these proportions, all nestled into one perfect 15 minutes. But that's all just construction. The effect, I hope, doesn't depend on any of this. To sit in front of something huge, something that defies my human sense of scale, of patience and attention, something that is ringing and singing and shaking with unseen forces, and to be overwhelmed by it – that is my kind of religious experience, and what I hope to unleash in AMEN.